Assets such as a Standard Page can be used as an e-commerce item on an Ecommerce Form. In order to define the price of these assets you need to create a Metadata Schema. Once you have created and applied this Metadata Schema, you can send this information to an Ecommerce FormPage via the variables and source strings configured in the Asset Purchase section of the Ecommerce Form ContentsDetails screen. Price: enter the price of the item without the currency symbol. For example, 5.00 will price the item at $5.00. If this item is taxable, this price should include tax. Taxable: if the item is taxable, enter a value into this field, for example YES. If the item is not taxable, leave this field blank. Multiple: if multiples of an item can be purchased at once, enter a value into this field, for example YES. If the item does not allow multiple purchases, leave this field blank. Tip: If you do not want your items to be taxable or have multiples, these fields can be omitted from the Metadata Schema. These fields should be text fields. For more information on how to create a Metadata Schema, refer to the Metadata Schema manual. The information entered into the Metadata Schema must be sent the e-commerce form using the source string options in the Asset Purchase section of the Ecommerce Form Contents Details screen. The Asset Purchase fields are shown in the figure below. For more information on these fields, refer to the Asset Purchase Variables section of the Ecommerce Form Page chapter in this manual. : this will show the name of the asset and can be used in the Name Source field, provided you have given your asset the same name as its item. %asset_metadata_<metadata_field_name>%: this will show the information entered into a metadata field where <metadata_field_name> is the name of that field. For example, if a metadata field is created titled Value with the price of the item, will be used in the Price Source. Price Source: enter . This will send the information entered into the Price metadata field to the Ecommerce Form Page and evaluated to construct the price of the item. Taxability Source: enter . This will send the information entered into the Taxable metadata field to the Ecommerce Form Page and evaluated to determine if the item includes tax. Multiplicity Source: enter . This will send the information entered into the Multiple metadata field to the Ecommerce Form Page and evaluated to determine if multiples of an item can be purchased. When creating an e-commerce system using an Ecommerce Form Page, item assets must be linked from the Asset Listing Page to the form using the variables specified in the Asset Purchase section of the Ecommerce Form Contents Details screen. 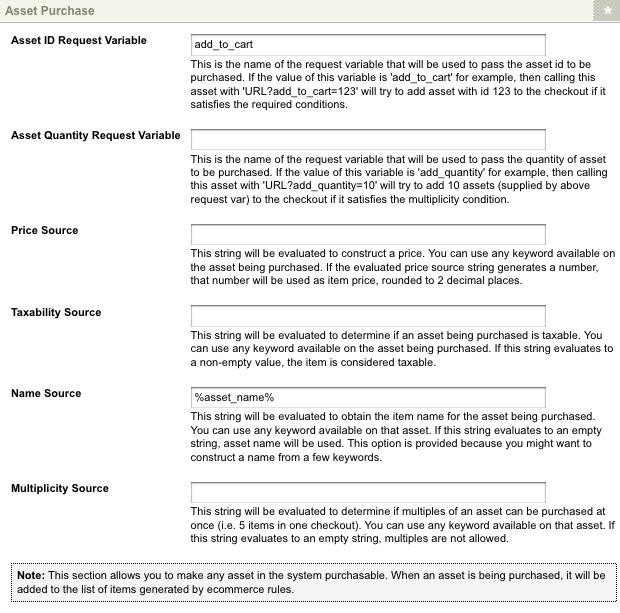 In the following example, the Asset ID Request Variable is set to add_to_cart and the Asset Quantity Request Variable is set to add_quantity, as shown in the figure below. On the Default Bodycopy of the Asset Listing Page, listed items should be linked to the Ecommerce Form Page using the HTML structure shown in the figure below. <asset_id_request_variable>=: this will add the Product to the e-commerce form, where <asset_id_request_variable> is the Asset ID Request Variable of the e-commerce form. The add_to_cart and add_quantity variables have been added to the link. The <asset_id> and <quantity> fields need to be replaced with the information determined upon the ecommerce setup. For example, if the asset ID of the Ecommerce Form Page was 100 and we want to sell our items in batches of ten, the link shown in the figure below will be used. In the above example, the <asset_id> is 100, linking the item to the form, and the <quantity> is 10, adding ten of the selected item to the form.